Artificial Intelligence (AI) has become a deeply relevant concept in recent years. Lately, however, it’s moved far beyond a mere topic of discussion among developers and influencers. The fact of the matter is, this technology already exists on a large number of daily-use-things with the aim of facilitating actions that we carry out throughout the day. If you were to try and pin down a pithy marketing description, you could say, perhaps, that AI makes our lives easier. One AI-enabled phone that’s already on the market is the Pixel, which features AI analysis in its cameras. Similarly, Huawei also makes a phone featuring hardware that’s designed to perform AI analysis. So, Besides Our Phones, Where Else Can AI Be Applied? Of course, our phones are just the beginning. AI can dramatically change our daily lives in all sorts of ways — here are six of them to watch out for. Authentication is a blend of biometrics and artificial intelligence. It’s possible that very soon, AI could be used to analyze and identify patterns as part of a new style of authentication system. The implementation of this technology would save us the tedious and outdated practice of creating, memorizing, storing, and typing in bazillions of different passwords. AI systems like Siri have the ability to learn during interactions with users, making it possible to understand their requests in an increasingly precise manner. Combining AI systems with augmented or virtual reality can help health professionals collect user data and detect diseases such as skin cancer or pancreatic cancer. As we mentioned earlier, some companies have already started allocating portions of their hardware for AI processing. Their goal is simple: to optimize the operation of their smartphones based on usage patterns. This technology can take us in all kinds of directions. For example, the system could choose the best time to show notifications to the user. It might detect that, during the weekend, some types of notifications are blocked by the user. Settings would then be adjusted accordingly to silence those notifications until Monday morning or whenever it was appropriate to let them through. To take another example, let’s say the user usually practices a sport every Monday from 6PM to 8PM. The device could detect that weekly pattern and decide that’s a good time to enter into energy savings mode. Devices usually contain a large amount of user data. AI could be used to create unique profiles for the different users and then record behaviors, preferences, and routines. This information could be useful for, let’s say, fitness companies since it can help identify exactly what activity each user performs, and when. There are AI systems that learn user preferences day by day and, based on the detected preferences, generate different filters so that the user can have faster access to the information they need. Companies who want to be part of the latest tech wave should start prioritizing artificial intelligence in the development of their products. As you’ve just seen, AI is going to be sought in a very big way by consumers who increasingly want to enjoy all the benefits this exciting technology has to offer. From our perspective here at Making Sense, Artificial Intelligence is exciting because it opens up a very broad spectrum of innovation. For us and for developers like us, the most important challenge will be to find the exact balance between efficiency and user privacy. Most users will not want to be constantly monitored and analyzed. They’ll also be increasingly protective of the information they view or send. Going forward, we’ll all need to keep those issues top-of-mind. As in all areas of life, we’ll need to look for the right balance that serves everyone. What’s the Best Way to Test Native Apps? Our Senior Functional QA weighs in on a burning question from the dev world. 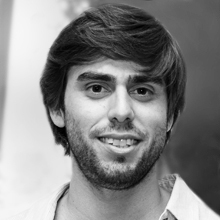 Eduardo is Senior Functional QA at Making Sense with more than a decade of experience. He finds time for playing soccer, socializing, and traveling (and if it’s a lake, river, or mountain destination, all the better!). And even with his busy lifestyle, he carves out time to lavish attention on his 16-year-old dog, Brown.